I am REALLY sure that someone will be pissed off at me for writing this post! This story will be a great example of cheaper is not better, and how important it is to have a mechanic you can rely on. I got a text from my little sister Ashley. She asked my “how long is it ok to drive without that big plastic piece underneath the car?” I may have said it before, but she drives a really nice 1999 VW Passat wagon. Her car has a plastic shield, or belly pan, under the car. It covers up the oil pan and prevents things from getting up into the engine. Her car will run with out it, but it is something that needs to be there. So, I get the text, and text her back, “What happened to your belly pan”. She tells me that she took it to a place to get the oil changed that was not the dealer. The later then belly pan fell off while she was driving down the highway. The bad part is, the pan is totally destroyed. Trying to be a good brother, I called the place and talked to the service manager. He was polite enough, but I could tell that he had no interest in dealing with me. I also called the local VW dealer. Basically the same treatment, but I was able to get the information that I needed. It turns out the cost of a new belly pan and related hardware was about $230. The manager from the quick lube called her back and told her that they would pay up to $50 for a replacement belly pan, leaving her with a $170 bill. So far she has be out about 2 hours of her time, $35 for an oil change, and add on $170 for the belly pan. When I asked her why only $50, she said they told her it was held on with zipties and it was already damaged. That might be true, but why didn’t they tell her that when they were servicing the car? Not only that, but I have used zipties to attach belly pans, it works REALLY well. 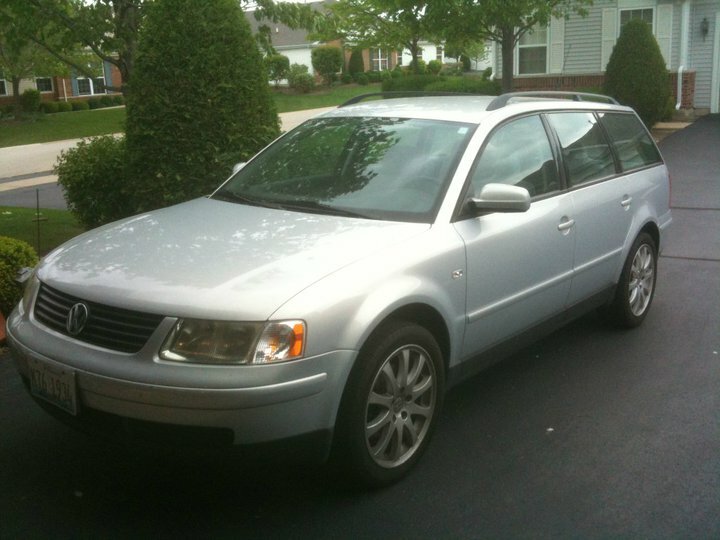 This is Ashley's 1999 VW Passat wagon. After some fighting, she got her belly pan replaced. It took several phone calls and I think her and her dad had to go down there, but it is fixed. She learned a few life lessons with this experience. Cheaper is almost never better. I still learn this one from time to time. There is a difference in getting your car serviced at a good dealer vs anywhere else. Wasting time to try and save money is a bad choice. If a place does something wrong, YOU have to fight to make it right. Do not let someone walk all over you. Well Ashley, sorry you had to be the topic of this post, but I thought it would be a good story to help everyone out. I am really glad you got your car fixed, and to quote her, “I know that now. First and only time I didn’t/wont take it to the dealer”. I’m not into cheaper is better either. I always get suspicious when something is way cheap. I always wonder where they are cutting their cost. Great post. It wasn’t just about cars either. Sorry this happened to your sister. You and me both, I still try and save money where I can, but I to have been burned by buying cheap. Thanks for the kind words. I don’t know if I ever told you, but I started an experiment in August 1994 when I got my 1994 Saturn SL2: I serviced the car by the book, at the dealership. That car lasted for about 15 years and was at about 190,000 miles when the engine blew up. I think that’s pretty good for a car that cost only $15k when new. Yeah you can get an oil change cheaper at a quick-lube place, but if that’s all you ever do to a car, it will suffer from lack of maintenance because as you know there is so much more to auto maintenance than just changing oil. To me, a huge part of it is having a mechanic I can trust. I tell Rusty all the time that your integrity is the reason I am a customer at your dealership. I know that if you tell me something is wrong with the car, there is a problem with the car. I know that if you tell me it’s not the car, that I know it’s me. 😉 Similarly, I take our Odyssey to a local shop that I know I can trust. (Sorry, but the sister Honda dealership is not impressive to me, and I’ve tried them multiple times.) I know that if either you or they tell me something, I can take it to the bank. What truly blows my mind is that people will spend $20k or $30k or more on something and then will not properly maintain it! I mean, really, is $100-$500 every 5-10k miles really that much on something that will, when properly maintained, run for 20 years or more, and hundreds of thousands of miles? 1)THANK YOU! I really appreciate you kind words. 2) That Jetta is be running forever! 3) I had the exact same feeling about that Honda dealer. That is one of the main reasons that we do not have a Honda. The worst part is, the company I work for owns that dealer! @Charles my best guess to the answer of why some people never take care of their car is that they believe it is like their refrigerator (appliance), that they don’t have to do anything because it will run all the time no matter what, and they don’t realize that when they do that they are driving around a ticking time bomb waiting to go off, and when it does, they complain about how the car was built “cheaply” and thats why it broke, or that its the cars fault for breaking! ABSOLUTE MADNESS!!! @Brandon, I use to think that way about home a/c systems. That was until a couple years ago, in the end of July. I came home to no a/c. That was a $2500 lesson I learned. OUCH! I think adding a car maintenance class to drivers ed would be awesome! My boss and I have talked about doing something like that at a few local high schools. I think it would really benifit young drivers. It’s funny how you can teach kids how to drive, but not what do if they get a flat tire. If your steering column trim is intact, then the steering wheel will need to be removed. It will be almost impossible to replace the switch with the trim in the way. Other VW models do not require the wheel to come off. Charles. First of all unlike you at her age she is a little more responsible with money. Unlike you I wont air your dirty luandry. If you would have bothered to stay in touch you would have found out there was a happy ending. She payed nothing. They bought a new part and installed it. If you are going to put it in writing your facts should be correct. Her and I both would love to always have a mechanic do all the work in today’s economy that is not always possible. I would suggest in the future offering help and suggestions instead of criticizing. It just makes you sound like a cry baby. If you reread the post you will see that I DID say that she got it fixed. The point of the post was to show how saving money sometimes doesn’t. I am really glad she got her car fixed properly. The place did what they should have and I think that is great. You state “Unlike you at her age…” then “I won’t air dirty laundry”, that’s just petty. Frustration at getting an oil change wrong is not exactly airing dirty family laundry. Lighten up Tom. Do you seriously think Charles doesn’t have his sister’s best interest at heart here? I know this guy well, and I can state without a doubt, that he is trying to teach something here. She is not the only one to do this, but he doesn’t want her to fall into the same difficult situations as others have. And finally, there’s only one post on here that sounds like a crybaby, and buddy, it ain’t Charles.